Jose Mourinho watched 4-1win at Old Trafford in ‘secret’ location – Kenyatta University TV (KUTV). All Rights Reserved. Zlatan Ibrahimovic and Anthony Martial each scored twice in the EFL Cup victory, which sets up a semi-final clash with Hull City in the new year. Mourinho’s side have won at home just twice in the Premier League this season, and drew 1-1 with West Ham on Sunday, but the Portuguese boss says the performance is no different to what they have been producing previously. “I’m pleased with the goals, because the performance is something we are used to, we are playing very well at home, and this was more of the same,” he said. I think after their goal we had 10 minutes where we felt it deeply, and the players on the pitch couldn’t hide that, because West Ham’s first shot was the equaliser. “But in the second half the team got the confidence to play and to win comfortably and playing beautiful attacking football, which is something that the fans like, but we need results. “I told them at half-time that it is not possible to stop playing so well because of a goal. I told them to forget about the goal, 1-1, and that we are playing so, so well that we have to keep comfortable. Forget the undeserved goal. Summer signing Henrikh Mkhitaryan put in a fine show at Old Trafford, assisting the first two goals, and Mourinho insists he is starting to see the Armenian adapt to the side. 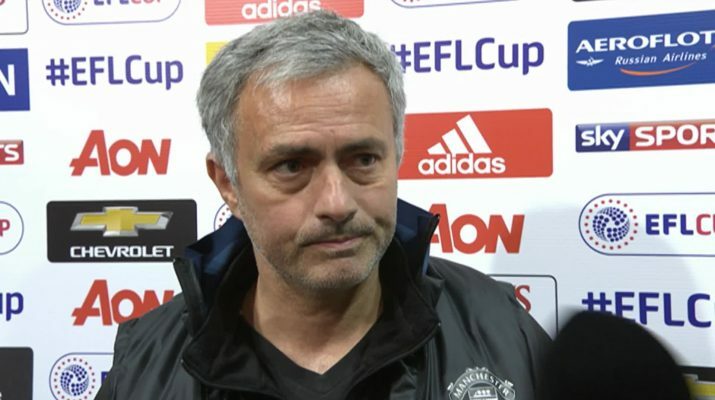 “I am so happy today because today was against a Premier League team with Premier League qualities and characteristics, and that showed clearly his evolution,” Mourinho said. “Today was against a proper difficult team, and Mkhitaryan could perform this way, and we are really happy. Asked where he watched the game, Mourinho said: “Secret. I was in contact with the bench, and to be honest yesterday we worked really, really well, and everybody was prepared. On top of that I trust my people, my assistants. I’m really happy with the players. “I was calm with the draw. If a team arrives here it’s because they have put a lot on the competition. I’m sure that Hull City has an amazing memory from Wembley.